Holi is a festival celebrated by Hindu community along with other community to increases the fellowship among peoples. It is mainly celebrated in Nepal and Indian sub-continent region and this festival celebration in abroad is increasing every year. It is a 'festival of colors'. This festival is celebrated with the beginning of the spring season or say it signifies the beginning of the spring season or the end of the winter season. It is celebrated on the last full moon of the lunar month in the month of Falgun (Phalgun) in accordance with the Bikram Samat Calendar i.e. on (February-March). This festival signifies the victory of good over evil, along with the arrival of spring, end of the winter. It creates an closing environment that gives opportunities to celebrate with friends and family, play with colors, laugh with joys forgetting and forgiving every king of disruption, misunderstanding and evil feeling with increasing closeness with repairing broken relationship increasing harmony and brings together for common benefits on human kind. The legend behind the holi festival are many. One of the famous story associated with this festival is regarded as the story of Holika Dohan (i.e. Holika's Death). Holika, the sister of evil King Hiranyakship was burnt death and on her remembrance Holi Festival is celebrated every year. Holi is only be enjoyable if you play with friends and relatives using different colors. Holi is celebrated with color powder and colored water filled in balloon throwing on someone else among friends which are ready to play. If you don't prepared for play, it may cause any trouble during play you may damage your precious item due to water. Water may entered on eyes or ear, mouth parts anywhere. You may get hurt while running from escaping water or colour filled 'Lola- balloon with colored water'. In the same way playing holi with anyone that is not ready or agreed to play holi may cause a trouble. You may get any type of blame if something unpleased happen to anyone if they are not agreed to play holi which is illegal as well. 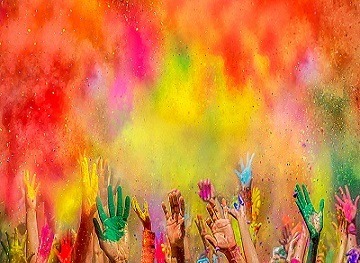 Color powder is used basically during color festival – Holi. The powder used should be non-toxic free from heavy metals. These are bright and the combination gives the favorable color you like to play. Holi powder is made home as well mixing food coloring in the flour and mixed well. The color powder are save to human body but some may have allergic to the color. The festival of color is celebrated with different color. The only things to notice is that the color used should be hygienic that don't harm human body. The celebration color may be red, green, yellow, blue, pink, and many more on mixed on. I like to say Happy Holi to everyone. Celebrate this festival with joys being little bit conscious about the precaution that should be followed during playing with color. Make the festival to join the relationship among people, decreases the distance instead of creating violence and situation of quarreling and blaming one another for wrong doing. I would like to suggest to play holi with that one who ageed to play with full of discipline. The culture is ours and we need to preserve it by celebrating in a good manner. These festivals is our identity. If we spoil festivals that is equivalent of spoiling oneself. Enjoy Holi! Happy Holi to all!